January 2009 - Page 2 of 3 - Pebbles, Inc.
We made it to Anaheim…and in record time! Our pilot seemed to be in a hurry to get from Utah to Anaheim and our driver from the airport to our hotel was in an even bigger hurry! It’s still amazing to me that we made it to the hotel in one piece! Today was setup day at CHA–12 hours later and we were finally done setting everything up. 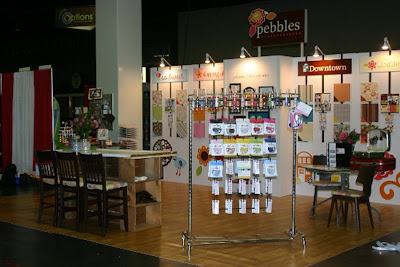 I am so, so excited about our booth and was even more excited to see everything come together. Oops…already found a mistake! See how that says, “gathering life’s memories”? It’s supposed to say, “gathering life’s moments.” Oh, well. It’s too late to fix it! We’ll get it right next time! More to come…live from CHA!! We’re busy finishing up all the last minute details and getting ready to head off to Anaheim tomorrow night! Be sure to watch for UPDATES FROM CHA! I don’t think we could be more excited about this release! New products will be shipping out within the next week or so, so be sure to look for it at your favorite Pebbles retailer! 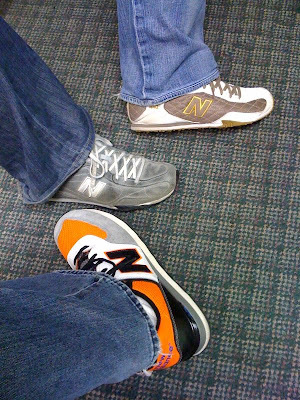 New Balance Day at Work! Who belongs to which shoe? Take a guess. Choose from Josh, Amy or Lindsay. Crazy. I started my day this morning, eating my lunch that I didn’t eat yesterday. I have 4 day old hair and didn’t even pat it down. 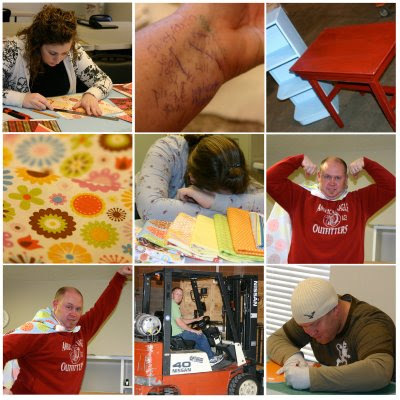 My notes are all over my arm… reminders of to do’s I can’t forget. We worked non stop and are wrapping things up… I believe I can see the light at the end of the tunnel… and I pray it is not a train! Sometimes it feels like it’s the last minute details that take the longest to complete. Our designer material came in a slightly different color, much to Lindsay’s horror. A little tea bath took the edge off and it looks good 🙂 Bonnie & Kristia are working hard in sales, Larry & Josh stayed late figuring out a way to secure our sign to the display. Ash & I headed over to Lowe’s tonight and picked up flooring & misc. hardware. Everyone at Pebbles Inc. has worked so hard to get it all ready. Last minute details to pack the crate up tomorrow morning and we are done. We fly out a week from tonight. We got home late, but Ash & Paul had surprised us with a Stouffer’s Lasagna in the oven (yes… they are still making room for beef in their freezer). We watched Signs & Psych and stayed up too late. It was nice being home together. I am grateful all of my girls are so willing to pitch in and fill in my holes at home this week… actually I always have holes, just not this many. The girls told me that there is a dead bird in the driveway. I was sad and asked where? ‘Under your car Mom. It’s been there all week’. I’ve been running over the dead, frozen bird all week. I feel thoughtless & disconnected this week in my extreme busyness getting ready for the show. I am probably going to go to bird hell and be pecked to death, deservedly so. My life is unbalanced this week. Ugh! Three more days until our booth ships out to California for the show. 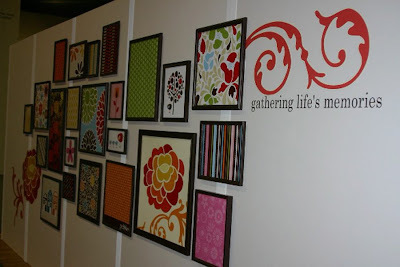 We took all the display pieces over to the warehouse and arranged them in a 20×20 foot space. There is still shopping to do and holes to fill. Larry spray painted our thrift store frames dark brown, which pulls our booth together. Josh has been printing out all of our designs, Lindsay is working on our show email, Bonnie is working on the order form, Kristia on sales and Mona & the girls are invoicing & packing. Lots to do, we don’t have the luxury of time, so everything has got to come together quickly.